It was so much fun to go to Zumba in San Pancho after being away for almost a year! Esther’s Zumba class in San Pancho (San Francisco, Nayarit) was where I first became hooked on Zumba. 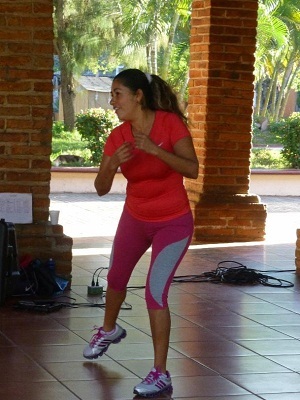 I wrote about discovering Zumba in San Pancho in my first “Zumba Mexico!” blog post. Going to Esther’s class again this week was like returning home. Most people in the class were local Mexican Nationals, and about one-third North Americans. Esther made me feel so comfortable when I was trying to learn new Zumba dances, with her easy-going style and her beautiful smile. I was having a little difficulty learning the steps to one of the Latin dances and she danced her way over next to me so that I could see exactly what she was doing. In a few minutes, I had the rhythm and she danced off to her usual place in front of the class. After class, I asked Esther, through interpretations from Jon and Ana, one of the women in class, how it is possible to provide this free Zumba class. What government agency pays her to teach Zumba? She said that the Bahia de Banderas Municipality (City of Banderas Bay) pays the Instructors to hold these classes in towns within their service area. The purpose is to address the increasing incidence of Diabetes and obesity in Mexico. The women are encouraged to bring their children to class to set a good example and reinforce exercise beginning at a young age. What a wonderful idea! The classes are free to anyone who wants to attend. Esther just asks for a small donation from visitors, such as 10 pesos, to help with her bus fare to and from her home in Lo de Marcos. Esther teaches classes in San Pancho twice daily, at 8:30 AM and 5:00 PM on the Plaza del Sol, Monday through Friday. She also teaches the Zumba class in Lo de Marcos at 7:00 PM Monday through Friday. The city government, through the Department of Culture, Education and Sports, continues to support physical fitness for the inhabitants of Bahia de Banderas in order to lead a healthier life. FREE ZUMBA classes that are sponsered by the City of Banderas Bay (Municipality of Bahia de Banderas) include Compostela, La Cruz de Huanacaxtle, San Vicente, San Juan de Abajo, El Colomo, Valle de Banderas, San Jose del Valle, El Porvenir, Mezcal, Valle Dorado, Jarretaderas, and Bucerias, among others. To read more about this physical fitness program and the certification of Zumba Instructors provided by the City of Banderas Bay (Bahia de Banderas) go to this government website article: Fitness.